Alan Hughes has a background of 30 years service with the then Gwynedd Fire Service and later the North Wales Fire and Rescue Service, where he eventually served in the role of Watch Manager. He maintained a very high standard of Service Delivery and was the Officer in Charge of countless emergencies during his career. 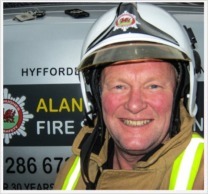 Alan has more than 31 years of Aviation Fire and Rescue Service experience, achieved by devoting his spare time teaching Airfield Firefighters. He holds a CAA ‘Aerodrome Supervisors’ certificate and was the top student in this category at the International Fire Training Center at Teesside College in 2004. He has a vast experience of delivering Fire Safety advice to owners of private dwellings as well as instructing staff of residential care homes, industry and commerce. He also has instructor qualifications in a number of references and is the holder of an Introduction to Teaching certificate issued by University of Wales Newport . He was awarded the Long Service and Good Conduct Medal in 1996 and the Queens Golden Jubilee Medal in 2003. He has also been awarded the Chief Fire Officer’s Letter of Congratulations and a Police Commendation for Bravery. 'Alan Hughes Fire Safety Training' is an approved supplier for the North Wales Learning and Development Services Collaborative Framework for Local Authorities. •	PGCE (cert Ed) part one (Introduction to Teaching). •	Holder of IOSH Managing Safely certificate. •	CAA approved fire training provider for Licensed Aerodromes and Helipads. •	Lower Category Aerodrome Supervisor. •	A ‘Clean’ enhanced ‘CRB’ disclosure. Operating from our base in Caernarfon, Gwynedd, we are able to offer our service to private, public and commercial clients across North and Mid Wales. •	Known to Alan Hughes personally and vetted by him. •	Serving or former members of the Fire and Rescue Services. •	Experienced and competent in the type of service being provided.